Material : Silk. Due to the difference between different monitors, the picture may not reflect the actual color of the item. Condition: new. We believe that a good communication will be helpful for solving the problems. 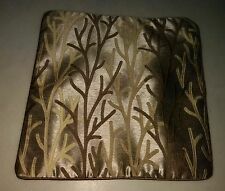 Poly silk Cushion Cover 16"X 16"
16”X16” POLY SILK CUSHION COVERSSHOWN IN PICS. ASIAN - BEAUTIFULLY EMBROIDERED PEACOCK CUSHION COVER ~~~~~~~~~~~ Style: Cushion Cover Material: Silk Blend Size: 16" x 16" Condition: New without Tags COLORS: Beautifully embroidered Peacocks in Yellow and Gold on Chinese Red Silk Background. Backside is more the same red as the front. Cannot get good shot of color due to lighting. Origin:China ***Note - Slight residue from Price tag on back as seen in photo. And there are two small areas where the cording is showing in the piping. Hard to notice from the front. The lakai mafrash side panel i used for this pillow cover dates back to 1950s. I used cotton for backing this pillow cover and the woven parts are all lined with felted interface fabric. No insert, no filler. The lakai mafrash side panel i used for this pillow cover dates back to 1950s and is from Uzbekistan. I used cotton fabric for backing this pillow cover and the woven parts are all lined with felted interface fabric.